The lodge was new for 2016 and is clad in cedar, located at the edge of a small wood with a large deck to sit out on. Inside there is a lounge with TV, dining table & chairs and small kitchenette with fridge, microwave, kettle, toaster & single electric ring. There is a bathroom with shower, sink & loo & a full sized double bed. The lodge accommodates a maximum of two people, who must both be over 18, with a studio style layout. Gorgeous Cosy Place To Stay, Quite Magical! I stayed at Cedar Lodge for my birthday in December and the whole lodge was decked out with gorgeous Christmas decorations and festooned with magical lights everywhere. It is very well equipped and you get greeted on arrival by the owners who are lovely, and the kitchen is stocked with a welcome bottle of wine, coffee, fresh milk, etc. A really lovely cottage, looking to return in the summer as the outside decking area is really quite large and should be enjoyed. Highly recommended. wij zijn en kort weekend gebleven voornamelijk was de lodge bedoelt voor ons om te slapen en de dag door te brengen in Bath. maar voor twee persoonen een ideale plek om in door te brengen lekker knus en een goede service zeker een aanrader. Absolutely beautiful and quiet place, had a wonderful time. The lodge is very clean and well maintained it is so cosy and stay very warm inside. The staff are so friendly and helpful made us feel so welcome. I would definitely recommend this prefect little hideaway to any adult couple. The surroundings towns are very nice and easy to get to by car with eat out while we was here and found a lovely town called keynsham and again people very welcoming and friendly, very easy to get to Bristol city from there as well. Great stray would love to come back! Peaceful, cosy and child free! My husband and I were offered the chance of a child-free 2 nights away for the first time in nearly 5 years! 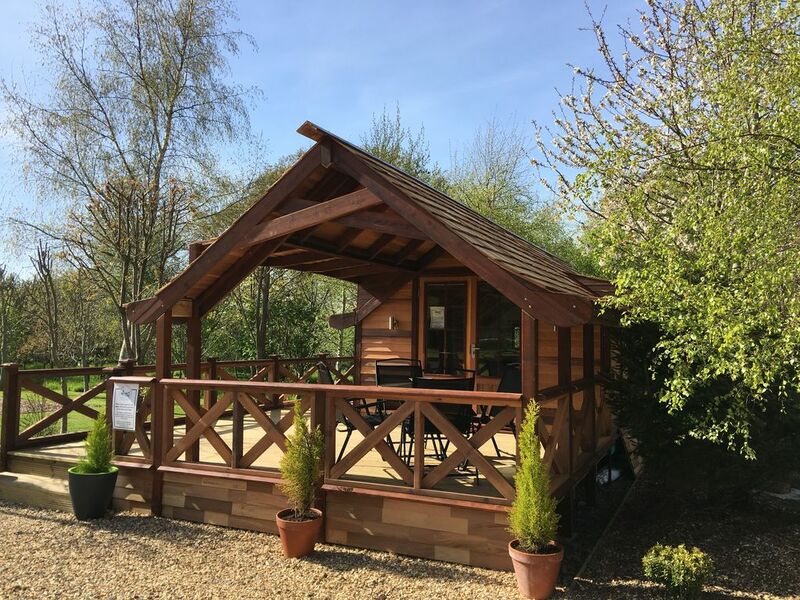 So when we searched online and found the lodge at Chew Valley Caravan Park, we booked it immediately. It was in the perfect location for us to travel to all the surrounding places of interest, and the fact that it was adults only was a huge bonus for us. When we arrived, the lodge was as charming as it looked in the photos online. We really wanted for nothing during our stay, it was all provided for us from clean sheets and towels to milk in the fridge! We particularly loved sitting out on the porch for dinner and breakfast. The park was really well kept, clean and so peaceful. The staff were very friendly and welcoming on arrival and made every effort to make our stay a great one. We wouldn't hesitate to stay in the lodge again should we get the chance and have already recommended it to friends who regularly visit the area. We enjoyed our stay in our cosy log cabin, The Park was peaceful and private and close to all the tourist destinations we planned on visiting. All the staff were knowledgeable and friendly and would definitely return again.